These days, we see plenty of homes that mix in midcentury vibes, which we love, naturally. 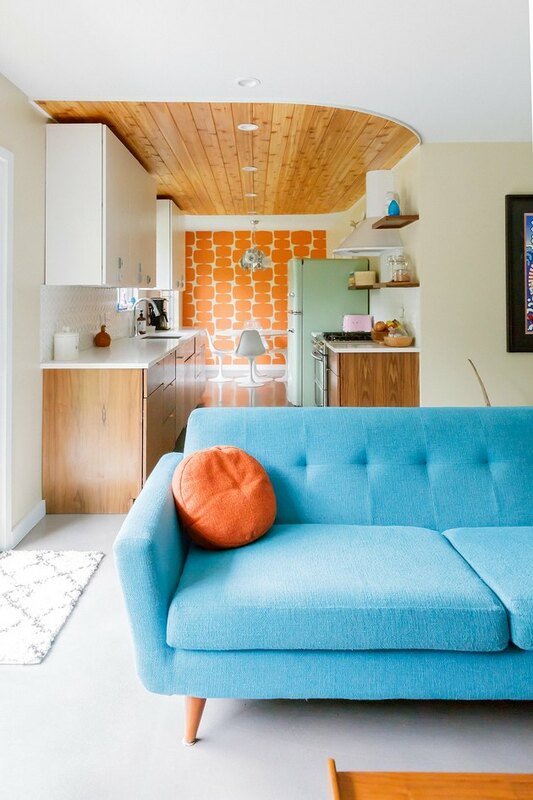 But it can be a nice change to see a space that really goes for the swinging '60s. That's the direction Austin-based QuarterLab Design Build leaned into when they worked with a client who had a particular love for midcentury design. (As a result, owner/founder Stan Hajost says it's one of the firm's favorite projects.) The property, located in Austin's North Shoal Creek neighborhood, is typical of the area — mostly ranch homes built in the '60s and '70s. Luckily, the three-bedroom house still had great original details like wood paneling and tile. 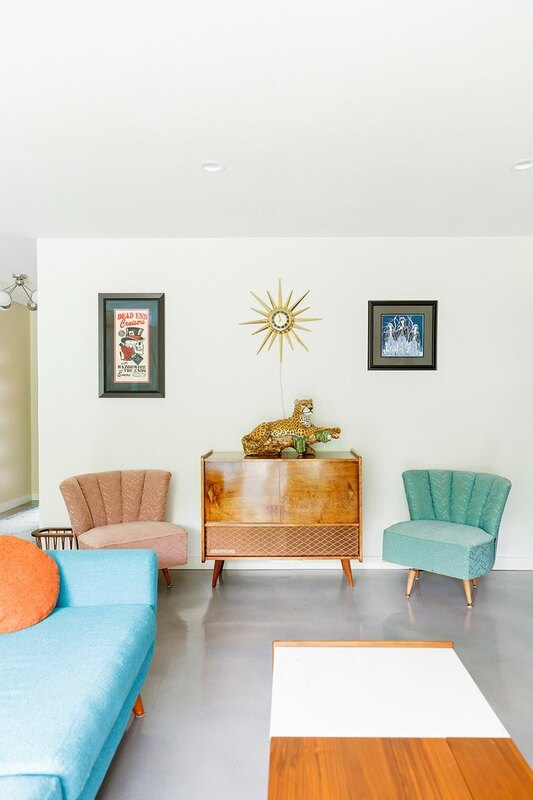 Hajost's team sought to bring in updated amenities, while infusing the space with fun, full-on midcentury decor: think classic vintage furniture and colorful, splashy prints. 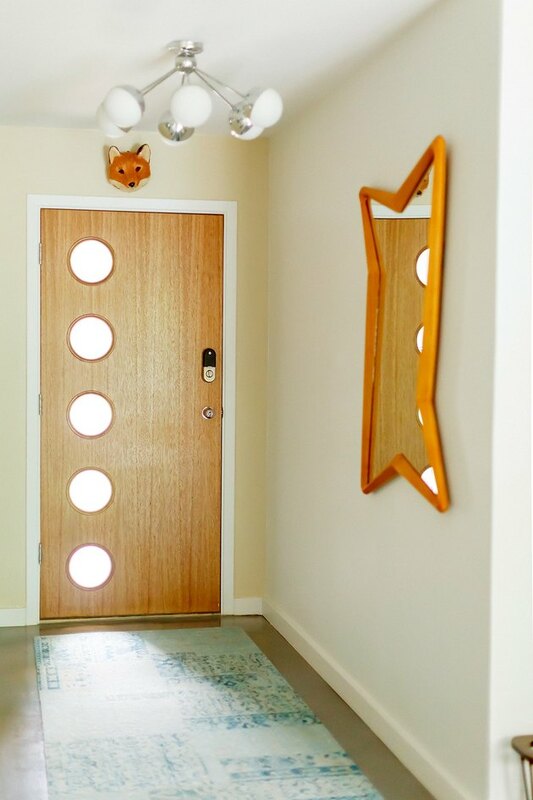 There are space age vibes from the get-go thanks to a line of portholes on the front door and a silver light fixture with globe bulbs. An upgraded 1960s record player from ATX Record Players is one example of how the design team succeeded in embracing the period, while still updating it (the piece is vintage with new engineering). If you're going to go retro, you might as well have a sense of humor about it. 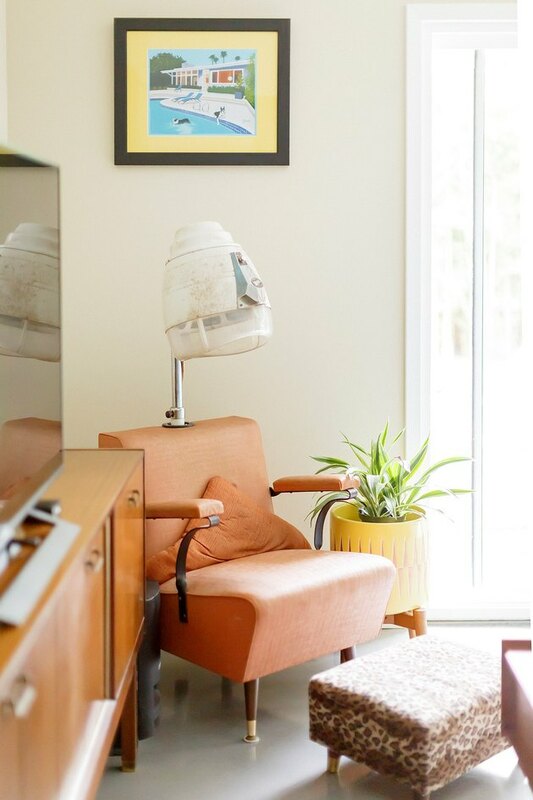 To wit: This vintage salon hair dryer seat, which was found at Goodwill. The team took full advantage of Austin's rich supply of antique shops, vintage stores, and estate auctions. The credenza comes courtesy of Rave On Vintage and the Margaret Keane print was found at Antique Marketplace. 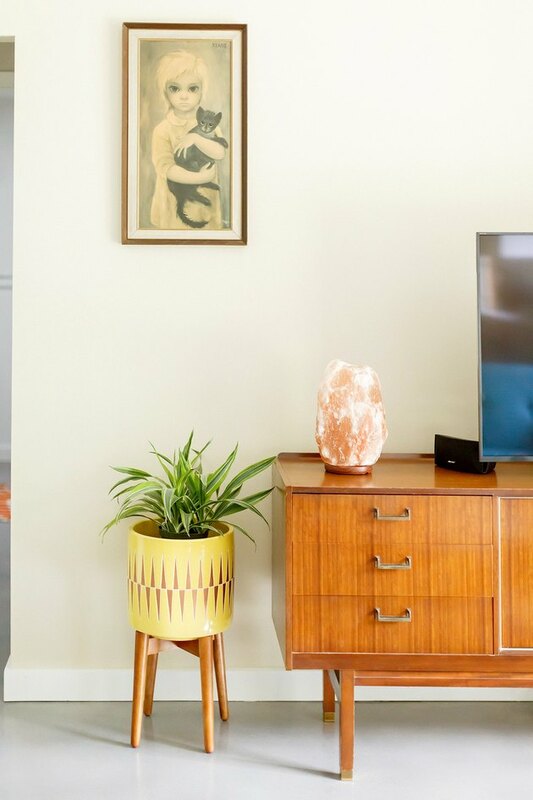 Of course, furnishing an entire house in vintage is tricky and costly, so QuarterLab also brought in accents from West Elm — like that funky plant stand. From the living room, a retro-style Big Chill fridge is on view from behind the bright-blue sofa from Joybird. In the dining room, a classic vintage Tulip table sits under a show-stopping Italian midcentury light fixture. 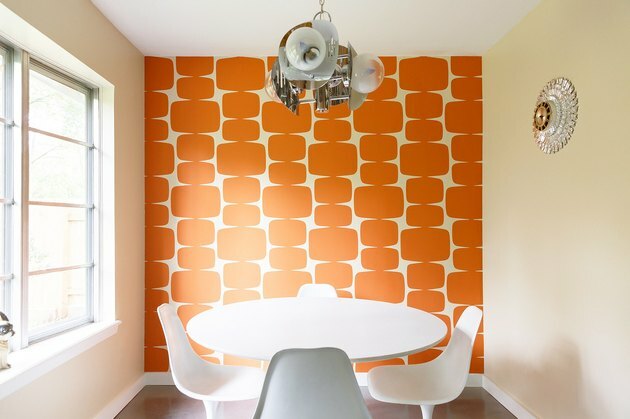 The wallpaper, made by Scion Wallpapers, is called Lohko. One of the more involved parts of the design was the custom-fabricated kitchen cabinetry by QuarterLab. The bottoms are made from solid walnut, and those polished chrome handles were actually purchased from Amazon. 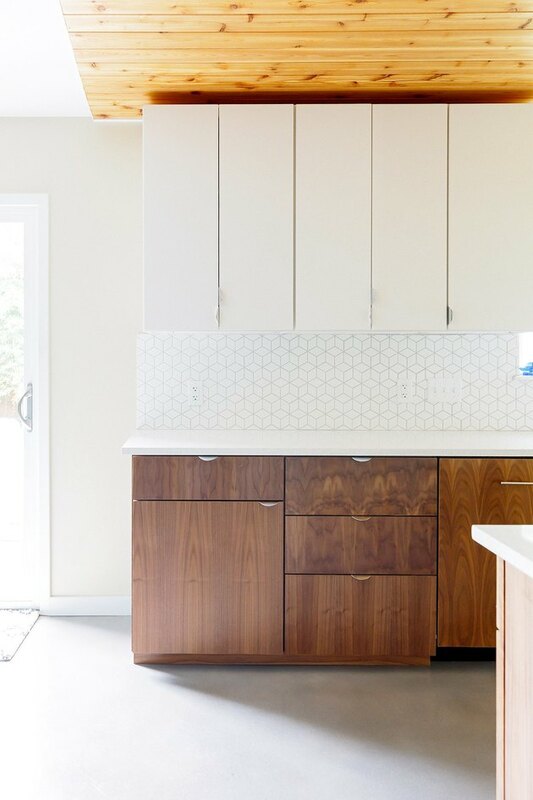 The backsplash features geometric tile from SomerTile, sourced from Overstock (we love a good deal!). While you might assume that paneled ceiling to be an original detail, it was actually crafted by the team from cedar planks. 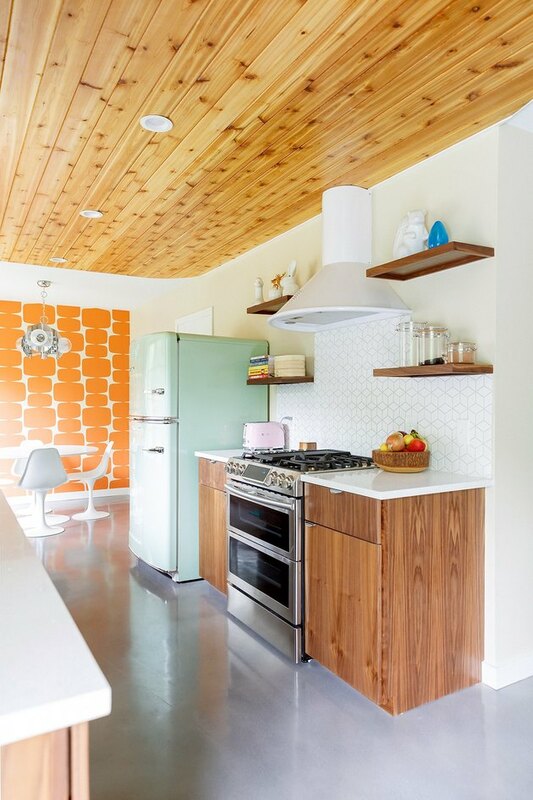 The effect adds to the kitchen's eclectic mix of materials. 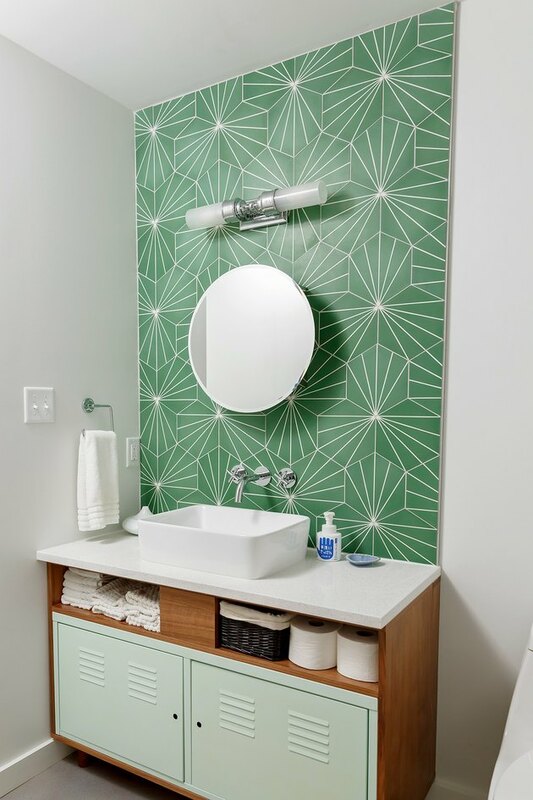 Talk about impressive IKEA hacking: The firm took a classic IKEA PS metal cabinet, painted it in a retro hue, and built a wood structure to create a completely unique bathroom vanity. (Even the legs were sourced from an old coffee table.) 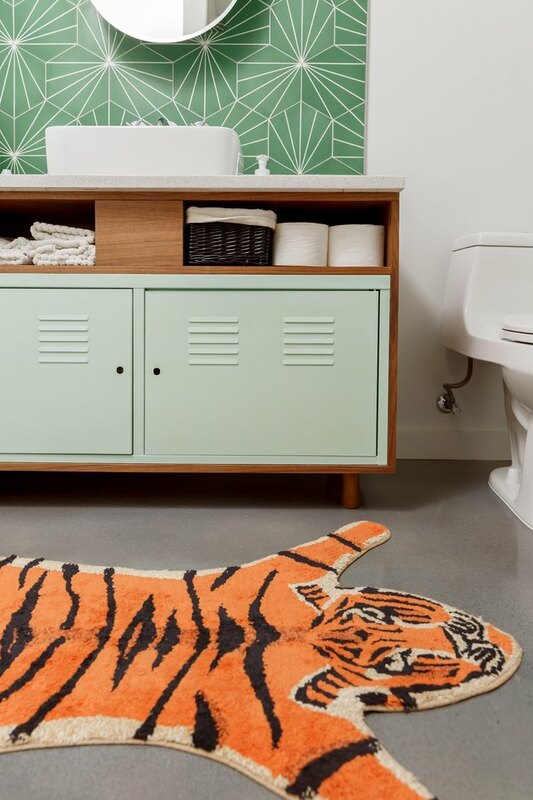 That fun tiger rug is from Urban Outfitters. These popular geometric tiles never fail to impress us with their versatility. Need them? They're the Starburst III shape from Cement Tile Shop.